“The Twenty Views of Dundas” is a collaborative print project to honor the history of the small town of Dundas, Minnesota, which celebrated its 150 year anniversary in 2007. Each of the twenty artists interpreted one aspect of the City’s history in a work of art, and working together with an art printer, created hand-pulled sets of prints in a very limited edition size. In this way, important aspects of Dundas have been memorialized in art, and made accessible to many to contemplate and enjoy for years to come. Artists were not only asked to participate based on their knowledge of and proximity to Dundas, but also by their own artistic directions and suitability to contribute to the set. The geographic makeup of the artists in the set is about one-third from Dundas, one-third from Northfield, one-third from Minneapolis/St. Paul, and a couple artists from various locations. The artists were provided with a visual historical reference of old photographs from the Dundas area that were scanned and put online. Many of the artists went to Dundas and met with people and visited sites. Several of the stories were converted by the artist’s interpretations into works for the set. Several of the works in the sets were also interpretations of the historical photographic record. ArtOrg organized and put this project together. We offered commissions to artists to participate (because we feel artists should be paid, and not asked to donate all the time), and opened up our printmaking studio to the project. We paid artists direct expenses on the project, and paid for supplies. We also organized printmakers to assist with the project, in the cases where the artists did not want to print or edition their own work. The Principal Printer for this project was Steven Nuno Nunez, a Carleton College graduate and recent candidate for the MFA degree in the Newcomb Art Department at Tulane University. Nuno editioned over half of the works that comprise the Twenty Views of Dundas. 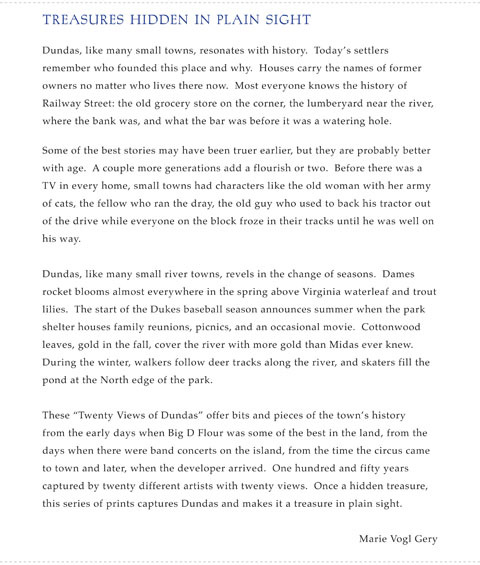 The concept of “The Twenty Views of Dundas” indeed has lofty historical associations. Japanese woodblock printers have traditionally used important geography, roads, and events as subject matter for very large print sets. Hokusai’s The Thirty-Six Views of Mount Fuji and Hiroshige’s The Fifty-Three Stations of the Tokaido Road are important examples of this type of print set. ArtOrg board member Bob Anderson had the priviledge of examining The Thirty-Six Views of Mount Fuji at the home of MIA patron Richard P. Gale. There is a short interview of Bob where he discusses his visit in a video on the right sidebar of this page. Why is ArtOrg doing this? 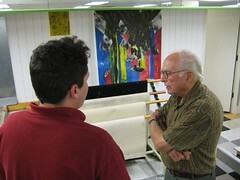 The project is designed to bring attention to Dundas, the artists and printers, and our printmaking studio. Through this project, the public’s knowledge and experience will increase, and in a direct way be educational in nature. This will allow a vibrant printmaking studio and further associated educational opportunities. Many of the artists are not printers as such, so the educational nature of the artist-printer interaction may be important. What do the artists and printers gain from this project? ArtOrg believes as a rule that artists should be paid for their art, and each artist for “The Twenty Views of Dundas” has been offered a honorarium to participate. 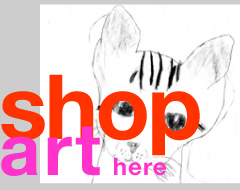 We also are providing the printmaking studio, supplies and paying printers to work with the artists. Therefore, the artists earn a honorarium, get up to four “Artist Proofs” of their own print series, and get to work with a highly-skilled printer. What type of printing methods will be used? The artists will be using any traditional printing method–which means the prints are hand-made without the use of computers, printers or other mechanical means. Lithography, where the art is created on 4-inch-thick blocks of 100-year-old limestone, will be one printing method. Still another method will be Intaglio, where copper plates are worked over in fine detail with small cutting tools and acid etches. Several artists are also expert woodblock printers. How many print sets will exist? The set is limited to the Founder’s Edition of five sets, and the Regular Edition of twenty sets. A so-called “Museum Proof” will be donated to The Dundas Historical Society. ArtOrg will chop each print with its special embossing chop. How can I buy the Twenty Views of Dundas? Please refer to the “Buy” section of our website. How can I display the Twenty Views of Dundas? It is easy and inexpensive. In keeping with the populist nature of this project, we designed it to fit in inexpensive frames from IKEA. The RIBBA frame in the 19 3/4 x 27 1/2 inch size cost about $20 to $25 each, and most framing shops will supply the archival foamcore and matboard, cut the matboard to size, and assemble the package for about $30 to $35 each. There are at least five different styles of frame pictured below. The prints from the Twenty View of Dundas set that you do not want to display will keep just fine in the archival box we supply with each set. Collaborative suite of 21 artists in archival box.